This section describes the Pokéwalker, the new peripheral that comes with Pokémon HeartGold and Pokémon SoulSilver, and lists the Pokémon you can find on each route. Styled like a PokéBall, the Pokéwalker allows you to tranfer a Pokémon to it and take it for a walk on a specified route. When a Pokémon is in the Pokéwalker, it can find items and battle wild Pokémon, with a simple battle system. The Pokéwalker main screen, showing the route terrain, Pokémon, and number of steps taken. 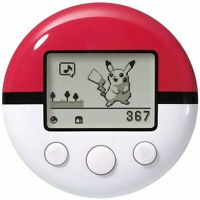 The Pokéwalker's main function is a pedometer, so as you walk it will count the number of steps you take. Every 20 steps counts as one Watt . The more Watts you earn, the more you unlock on the Pokéwalker, such as additional routes and rarer wild Pokémon. Your Pokémon also earn one EXP point per step, until they have enough to go up one level. After that, they will not earn any more until their level increases, which happens when transferred back to the game. It's relatively easy to gain Watts, just keep the Pokéwalker in your pocket as you go about your daily life of school, work, etc. I work in an office where I'm sat down a lot of the time and still get over 1,500 steps a day. If you play any sport you can get a lot of steps that way too. All the possible Pokéwalker routes are listed to the right. Some are only avilable through Wi-fi events so may be unavailable at this time. Each route requires a certain number of Watts on the Pokéwalker to unlock, with 8 routes available pre-National Dex and 12 after you obtain the National Dex (after beating the Elite Four and Champion). Each route has three advantageous types - if you send over a Pokémon of that type, the required number of steps to find each wild Pokémon are reduced by 25%. There are three groups of Pokémon on each of the routes listed below: A is rarest and C is most common. There are two Pokémon in each group, one of which is randomly selected from each group when you tranfer a Pokémon to the Pokéwalker. Only that one Pokémon from each group will appear in the wild, until you return from the stroll and transfer a Pokémon again.